I bought a couple halibut steaks over the weekend after realizing that we’ve been eating a lot of red meat lately and not so much seafood. Halibut is a great fish if you don’t like the fishy taste of some fish (salmon). It’s mild in flavor, absorbs flavor easily and cooks up quick. Make sure you don’t overcook the halibut (4-5 minutes on each side is more than enough), the meat will start to flake off when you know it’s done. I threw this marinade together with what I had on hand, it would have been nice to add in some lemon juice but this mix worked well. The tomatoes cooked alongside the fish in the same saute pan, soaking up all the juices from the fish and marinade. 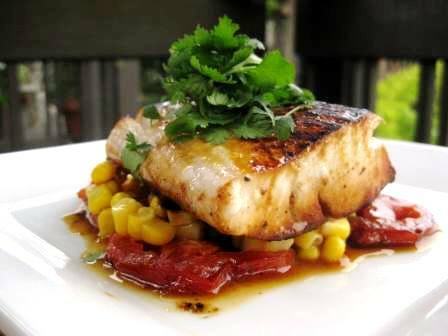 I layered the tomatoes on the bottom with some fresh corn and topped it with the beautiful charred halibut. Serve with some couscous for an amazingly simple and delicious meal. 3. Slice tomatoes and layer around the side of the pan. 5. Layer tomatoes, corn, halibut on a plate and top with fresh cilantro. Enjoy! Sounds delicious and qualifies as a super food recipe. I’ll try this and will post about it when I do. I am SO making this after finals!